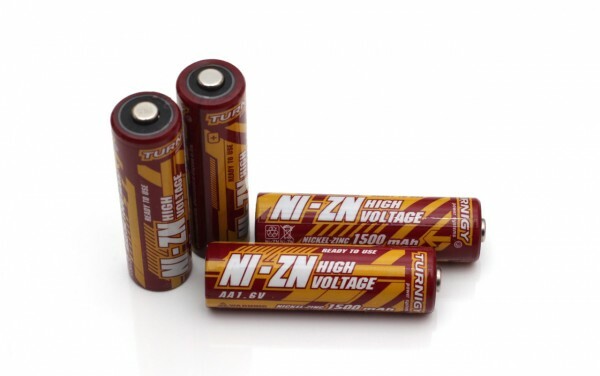 The 1.6V AA 1500 mAh Turnigy Rechargeable NiZn batteries are pretty much like all other Chinese NiZn batteries being sold out there, these are just made for the Hobby King’s Turnigy brand and offer the standard 1500 mAh capacity. We’ve already discussed the NiZn rechargeable batteries in more detail, so now we are just going to focus on their performance. Just a bit of warning – do not try to charge NiZn batteries in normal NiMH chargers and be careful when using them in various devices as some electronics might not be able to handle the slightly higher voltage of these batteries even when compared to Alkaline’s nominal voltage, let alone the even lower NiHM nominal voltage. We have started the test of the 1.6V AA 1500 mAh Turnigy Rechargeable NiZn batteries as we normally do with a low constant current discharge rate of 0.2A and the result we got was 1583 mAh as capacity or a bit over the rating ofthe batteries of 1500 mAh. So a very good start for the Turnigy NiZn batteries at a lower load, and going at 0.5A and 1.0A constant current load they still manage to perform great with useable capacity a bit below 1500 mAh. Even at the very high current load of 2.0A the 1.6V AA 1500 mAh Turnigy Rechargeable NiZn batteries manage to provide you with almost 1400 mAh useable capacity and that is a great result. In the end we can say that the Turnigy Rechargeable NiZn batteries do perform very well and have pleasantly surprised us with their results, so if you need NiZn batteries you might want to check the Turnigy ones, especially considering the good price.